Season 1 of Veronica Mars is the closest thing I’ve ever seen to a perfect season of television. Seasons 2 and 3, while they had their good points, also had many messy issues, but season 1 was what stole my heart. I own the box set, I watched it with groups of my friends in little Veronica Mars parties when it was first airing and I lived in America. I think it’s fabulous. I love Veronica Mars, not only the show but the girl, and one of the chief reasons is the many masks both show and girl wear. I knew as soon as I started these Sleuth Thursdays that I’d want to do Veronica Mars, and I decided the way I wanted to do it was to talk about the story and those masks. Veronica Mars is a classic noir story (disgraced hero, murdered femme fatale, corrupt society, what’s to be done!) flipped on its head—it stars a small beautiful blonde in a fancy high school as our noir hero. Hey baby. Hey, you so noir, baby. Veronica’s best friend Lilly was killed and she doesn’t believe the man arrested was guilty. She works for her father, a PI who used to be sheriff before he accused the most powerful man in town, Lilly’s father, of killing his own daughter. Her mother ran out on them, Veronica’s boyfriend (and Lilly’s brother) Duncan dumped her, and Veronica is an outcast. She’s got noir written all over her: she’s relatively poor in privileged surroundings, she has had epic wrong done to her, and she covers her torment with her rapier wit. She is very composed when other kids her age are freaking out—because the noir hero has flawless cool, but also because she’s been through things the other kids her age have not. She’s hard-bitten as well as vulnerable, and she is indomitable. Veronica, in her own words, ‘keeps chasing the storm’ even when she is worn down. Not only do we get an untraditional noir hero, but through her eyes we can see a different side to other noir characters. Lilly, the murdered femme fatale, was Veronica’s beloved best friend who was always loyal to her. She may have been typically mad, bad and dangerous to know, but she was a good friend. ‘You’re red satin’ she says to a more prim Veronica of days gone by, and after her death Veronica wears red satin and goes skinny-dipping: she’s empowered by Lilly’s memory. Lilly did some sketchy things while she was alive, but it’s never implied she deserved her death and it is always clear adults have done wrong by her. Note: those who have not heard Seanan McGuire’s ‘The Ballad of Lilly Kane’ have not lived. ‘I can’t help it, God made me fabulous,’ says Lilly Kane (Amanda Seyfried, in the role of her life). Lilly is vibrant and lovable: Lilly is much missed: Lilly is killed but never condemned. Veronica plays roles that are not offered or possible for most noir heroes because of who she is—a young, blonde, pretty girl. She’s able to learn from the femme fatale, which a noir hero certainly cannot, and adopt whatever femme fatale practises will help her solve mysteries… and the most important trick is not her undoubted sexiness, but how much people underestimate her. ‘Whoever said it’s a man’s world has no idea how easy it is to be a girl,’ she says, playing dumb and letting people play into her hands. ‘Must be the hair—blonde!’ she says, while playing ditzy blonde as she does many a time over the course of the show. She doesn’t usually woo people with her wiles (the one time she really does, with police officer Leo, he’s clearly hurt by her deception, she feels terrible, and it becomes a real relationship—real life consequences! Check those out!) but she often makes people think she’s pretty but dumb, and those who underestimate her do so at their own risk. There’s no pity to be found for those assuming a girl is dumb… and why should there be? She’s looking super tough and noir, but she’s in pink. This is not an accident. There are no accidents! /Matrix. The show always gleefully glories in how clever Veronica is. She does well in school, foils plots neatly, and sasses people about her smarts all the livelong. She gets the corrupt new sheriff to read out ‘Veronica Mars is smarter than me’–‘Oh, you stop it’ she laughs–and when her locker is raided for planted drugs and found clean she says ‘I’ve got a couple of suckers… in my bag’ to the principal and police officer. Another noir element is that Veronica is allowed to be darker and more ruthless than most TV heroines: ‘I’m not programmed to forgive and forget.’ Her friends and family know she has a heart—her friend Wallace calls her a marshmallow—but that does not mean she’s going to let anyone get away with anything. Economic necessity is one motive for her mystery-solving ways–‘I perform favours for friends’ ‘I can pay’ ‘Sit down, friend.’—but of course her real motive is love, for her friend and for truth and justice. Which again, doesn’t mean she’s all sunshine. She is cagey and wary and cynical, but while sometimes that cuts her off from others the show also displays that she is right to be so in many cases. A suitor built up over several episodes as the nice reliable guy who may be shipped off to Catholic school, is exposed as a double-crosser and a cheater. Recipe for heartbreak—except that Veronica is many miles ahead, and doublecrosses him with ease when he shows her his true colours. She’s a damsel. She’s in distress. She’s going to mess you UP. Veronica can do anything, and that of course includes having a romantic life: especially with two significant men. Sadly, one is the Bland Love Interest who comes with many a shining and fascinating protagonist. Duncan, the square-headed garden where the weed of self-righteousness thrives and the flower of charisma goes to die, was the usual result of the Good Person Our Morally Corrupt Star Yearns For: i.e. very dull. Very very dull. Also, as the golden boy among the corrupt, passively letting the corruption happen or not noticing the corruption made Duncan look like the kid was born with the dimmer switch waaaaaay down. DUNCAN: I’ve decided to take a stand against corruption. DUNCAN’S FRIENDS AND FAMILY: It’s cute you think that matters. DUNCAN: I will not be taking any actions but I may make a tortured face at the wall, and that’ll show you. DUNCAN’S FRIENDS AND FAMILY: The rich love a hypocrite! Occasionally he would do something terrible and interesting and everyone would perk up, but not often. He was also not super well cast: for a while we thought his empty eyes and strange zombie shuffle was a Brilliant Acting Decision based on the fact Duncan is taking drugs to dull the painful memories. Turned out, not so much! But for a heroine as cool as Veronica I would suffer through a lot worse than Duncan. And it wasn’t like there weren’t other options for our beautiful lady. … Yeah, I had a ship. Plus, le banter and chemistry. I started to want them to get together when Veronica revved her engine as Logan went past in front of her car, and he posed and smacked the hood of her car with his jacket. Things only got worse when he told her to ‘annoy, tiny blonde one. Annoy like the wind!’ Like many a love interest of a noir hero, he was bad news, but he was a lot of fun, and the sexiest thing about this particular tortured bad boy was that he could verbally keep up with our brilliant heroine. GLEE’S SUE SYLVESTER: I love corrupt schools. VERONICA: I refuse to either sing or cheerlead. I REFUSE. Joss Whedon is also in Veronica Mars in a guest role, which is excellent because Veronica is really very much Buffy’s heir: Veronica’s perfect blend of noir/high school drama blend is the perfect successor to Buffy’s blend of urban fantasy/high school drama. Other familiar faces are thick on the ground, both at school and during Veronica’s job. At one point early on Paris Hilton hilariously shows up. Both the high school drama and the noir mysteries are super-supported: there is no preferential treatment of one over the other, and the blend makes both work better. Veronica works on the student newspaper—she mostly takes photographs but she also covers a school election and in another episode defends her right to write a story on a school bomb threat and have freedom of student press, so I’m calling it—GIRL REPORTER!–TOTALLY COUNTS. But above all, Veronica, wheeler dealer, cynic, easy liar, bender of all rules, maverick, is in quest of truth and justice. She wants to find her friend’s murderer. She wants to rescue stolen dogs and stolen parrots: she wants to protect people and bring families together. ‘This is the face of truth,’ she says at one point and, in the end, I believe her. Veronica, her drive and her brilliance and her love of friends, family and truth, was what brought all the elements of the show together and made it work. I wrote this series about brothers and demons and always got annoyed because people would compare it to the TV show Supernatural, which I don’t watch: I’d always say ‘If I was ever going to model my books on a TV show, THAT TV SHOW WOULD BE VERONICA MARS.’ Not just like it, of course, but a combination of genres, something that tried to be as funny and as thoughtful. You get me, Horn Book. You really get me. I maintain that Veronica Mars is the highschool Mary Sue of humanity. Who wouldn’t want to have been her, flaws and all? I was just introduced to Veronica Mars earlier this year. After borrowing a friend’s season 1 DVDs, I watched the other two seasons online, basically back to back, with very little sleep and/or work done. VM is one of the greatest female characters ever, and your thoughts are spot on. As much as I would’ve loved another season or movie, really, I think it ended perfectly (especially for noir). I wish there were other shows like this with strong, flawed leads and great secondary characters and all the things that made this show rock. I wish there were other shows like it too! I’ve honestly marathon-ed this show with at least three groups of friends and, every time, watching THEM watch the mystery and the depth of the story unfold is truly a great pleasure. Every time I am again sucked into the sheer craft and detail of the show, the way all the pieces click and the way the characters, Veronica in particular, are allowed to have flaws and make mistakes and still learn. I LOVE, just LOVE, seeing how Logan’s character develops and how his relationship with Veronica just blossoms and takes the show into all sorts of new territory. A common joke, of course, is how often people say VERONICA MARS instead of just Veronica but you know after ALL these re-watches I finally know why: because Veronica Mars is a one of a kind force to be reckoned with and because, no matter what, you can be assured you will remember her name. It’s true, it’s a show to be savoured over and over again with friends who can discover it as you savour! I’ve seen a bunch of eps out of order, most from season 1. My husband just politely suggested he planned to cut me off from my Dawson’s Creek Netflix binge (I’d never seen it!) so we could watch Veronica Mars in order. I should probably do that since the D Creek is PAINFUL (Pacey is still cute though; but I like him better on Fringe). the only thing that irked me on Veronica Mars is how so many of the white guys look the same. I had trouble telling them apart. But at least the show has some diversity and not ALL the guys are white. So there’s that. And Amanda Seyfried is so great in it! This post is SO smart and fabulous. You have outlined so perfectly why I love this show (especially season 1) so much. I swear I feel like dropping everything and doing a rewatch right now. Congrats on the review! It makes me even more excited to read Unspoken. 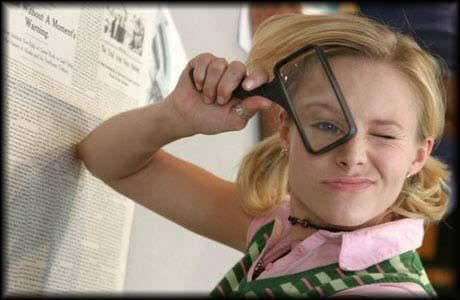 I miss Veronica Mars. Can’t wait for Unspoken! Sassy girls and their partners-in-crime-fighting are one of my favourite things. Also, your new website design is gorgeous. Mine, too. 😉 And thank you! I, too, was disappointed that Weevil was never a love interest. Of course, Logan was tons of fun to watch, but a relationship with Weevil would have been a completely different turn. GOD, I loved this series. I was sad it ended, but season 3 was kind of a disappointment and the pilot for season 4 was flat out WHA? scary, so probably good they stopped while they were mostly ahead. But yeah, it was seriously fabulous.